For this baby shower carousel cake, I used a 12" round pan for the bottom, and a 6" round for the top. The original cake is Wilton's Baby Go Round cake with my modifications. in advance, I super glued the 12" plate to the pillar and cut a hole the size of the end of the pillar in the center of both a 12" board and a 6" board. Buttercream icing was used for the whole cake. On the 6" layer, Tip #16 (star) is used for the blue and pink. Pipe blue around the top and bottom of the layer then pipe pink in a zigzag between the 2 lines of blue. Use tip #5 to pipe a small ball at the points on the 6" layer. Use tip #18 (larger star) for the squares on the bottom 12" cake. Alternate colors of yellow, blue, and pink. Ribbons cut approx. 20" in length, I super glued the ends to the 6" plate. Can alternate blue and pink or use all one color. Insert tiny babies into the loop and place a small dab of super glue to hold the babies in place. 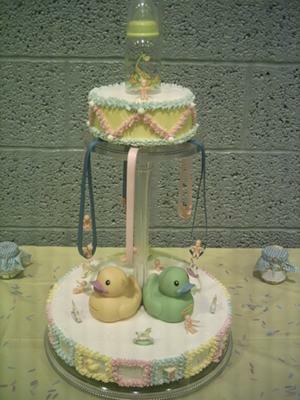 I bought 2 rubber ducks to place on the 12" round to hide the hole where the pillar goes into the bottom cake. Sugar candies are used in every other square on the bottom layer. A hole was cut in the middle of the 12" round. To assemble, slide the 12" round over the pre-assembled pillar and 12" plate. Super glue the 6" plate to the top of the pillar, super glue the ribbon ends to the top plate and allow to dry as you arrange the ducks, babies and rocking horses on the bottom layer. When the top plate seems secure, and the glue is dry, place a drop of super glue on the bottom of each baby and place in the ribbon loop, hold til dry. Next, place the 6" layer on the top pillar and place the bottle and any remaining babies on the top pillar. You did a really good job! I love the bottom layer around the side of it....so cute!